It seems since Bingo Hideout covered the story of golf legend Tiger Woods ‘car accident’ a few days ago that the worlds media has gone into what can only be described as a tiger frenzy. Stories are being told of the golfers serial adultery and that Woods has been busy buying the silence of one of his alleged mistresses just prior to a press conference where it was expected that the lady concerned, Rachel Uchitel would ‘tell all’. There are also stories being published that state Tiger Woods has made a cash deal with his wife to not file for divorce in the next two years. The internet is literally awash with posts, photos and humorous (and some not so humorous) stories about the Tiger Woods affair. How true some of the stories are is questionable but what is true is that Tiger Woods has ignited world interest by keeping his head down and not facing the media. His attempts to keep the lid on the whole story by a ‘no comment’ approach have just fanned the flames of interest and the story is now a huge global snowball. Even Bingo Hideout’s recent story in the Buzz had a huge amount of hits, proving that this is a story that is just not going to go away. In China a cartoon film has been made featuring lifelike avatars of Tiger and Elin, this is circulating on the web like a virus and shows the makers interpretation of the evening’s strange events, firstly with the official version supplied by Elin and then an alternative angry jealous wife scenario.There is a song on Youtube that has been created called ‘Tiger Woods Voicemail Slow Jam Remix’ featuring the voicemail recording that Tiger allegedly made. Bingo Hideout have also found some unkind posters on social networking sites saying that Tiger should now be renamed Cheetah! 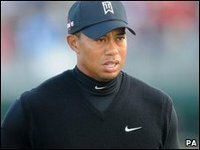 And of course as you might expect the new Tiger woods jokes are flying thick and fast, Bingo Hideout have been keeping an eye on all the gossip and have had much fun reading the many witty remarks that have been posted, we include some of the clean ones for your amusement: What’s the difference between a car and a golf ball? Tiger woods can drive a golf ball 400 yards! Or have you heard about Ping’s new golf club ‘The Cheater Beater’ and Tiger Woods crashed into a fire hydrant and a tree. He couldn’t decide between a wood and an iron. We leave the last word to The Sun newspaper, in their usual anarchic style their headline accompanied by a picture of Tiger Woods reads ‘I’ve let my wife down, I’ve let my family down (and he’s let his trousers down). Only in the Sun!